It’s holiday time… yeah!!! You’re decorating, baking, shopping, running around like a chicken with your head cut off… you don’t have time to slave all day for a yummy lasagna. But you do have time for a quick, easy, and delicious fake out in soup form. Similar to goulash, this soup makes a lot, reheats well, and is so hearty that you’ll be good and full for a long day of holiday madness. My version is a happy little melding of Paula Dean’s and A Farmgirl’s Dabbles. Heat olive oil in a large pot over medium heat. Add onions, garlic and green pepper, cooking until soft, about five minutes. Add beef and cook until browned, about five minutes. Drain fat from the pan. Add red pepper, thyme, oregano, tomato paste, brown sugar, salt and pepper, cook for 1 minute. Add chicken broth, diced tomatoes, tomato sauce and bring to a boil. Reduce heat and simmer for 30 minutes. Add noodles, and simmer until noodles are tender. Stir in Parmesan cheese and basil. To serve, place a dollop of the cheese surprise in each soup bowl, add soup and crostini, sprinkle a handful of mozzarella on top. Preheat broiler. 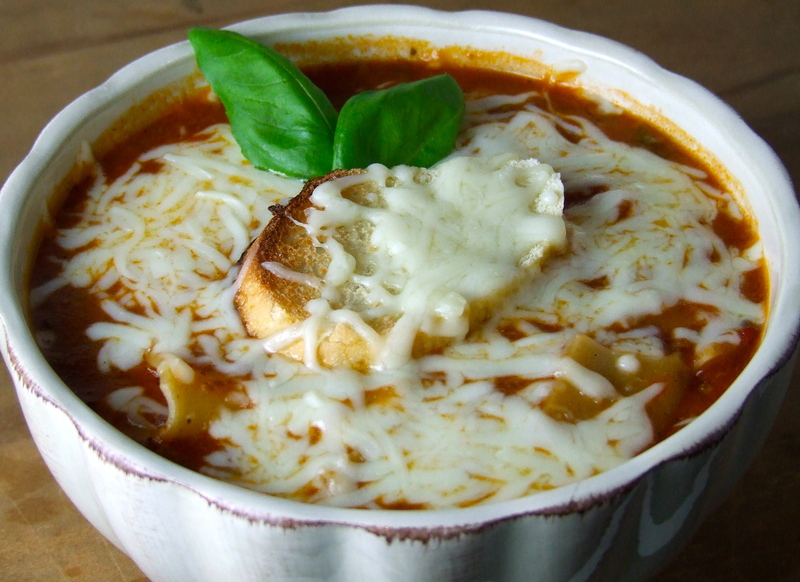 Broil soups, 6-inches from heat, 3 to 4 minutes, until cheese is browned and bubbly. In a small bowl, combine the ricotta, Parmesan, salt, and pepper. Cut bread into 1/4-inch round slices. Place on baking sheet and brush each slice with olive oil. Season with salt and pepper; place in oven and bake until golden and crisp, about 15 minutes. Remove from oven and let cool slightly. Rub each side with smashed garlic cloves. Hi someoneleftthecakeoutintherain, my name is Maria. This is an amazing recipe. I love all your recipes so much that I tried and added this one to my blog, but giving the link to here, as the original source, as I always do with everything I publish. Thank you very much for your time and kind consideration and for the excellent recipes you bring to us.